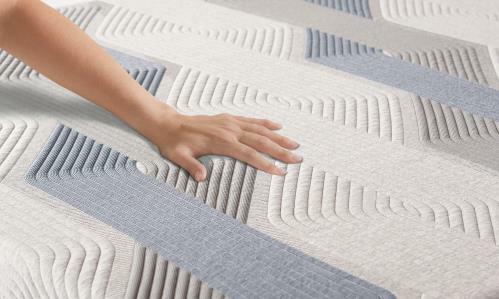 TempActiv technology is integrated into premium fabric for an instant cooling sensation you can feel the moment you touch the mattress surface. This highly-dense memory foam has both cushioning and conforming qualities for a firm, yet comfortable deep-down support. The Blue 300CT Firm 2019 King Firm Memory Foam Mattress by Serta at Prime Brothers Furniture in the Bay City, Saginaw, Midland, Michigan area. Product availability may vary. Contact us for the most current availability on this product. The iComfort Blue Collection of Memory Foam Mattresses are "Comfort Reimagined™". Using the latest in Cooling Gel Memory Foams and a Cooling Cover, your body will be embraced and supported in the most comforting way. The supportive foam core is encased with high density foam, firming the edge giving you full mattress top use. Come see what true comfort feels like. The Blue 300CT Firm 2019 collection is a great option if you are looking for Mattresses in the Bay City, Saginaw, Midland, Michigan area. Browse other items in the Blue 300CT Firm 2019 collection from Prime Brothers Furniture in the Bay City, Saginaw, Midland, Michigan area.